A few Mac users that update to Mac OS X discover their sound and audio output has ceased to work, leading to a completely mute Mac that does not respond to the volume keys. Fortunately, the mysterious missing sound output issue is incredibly simple to fix, and there is nothing actually wrong with the Mac. 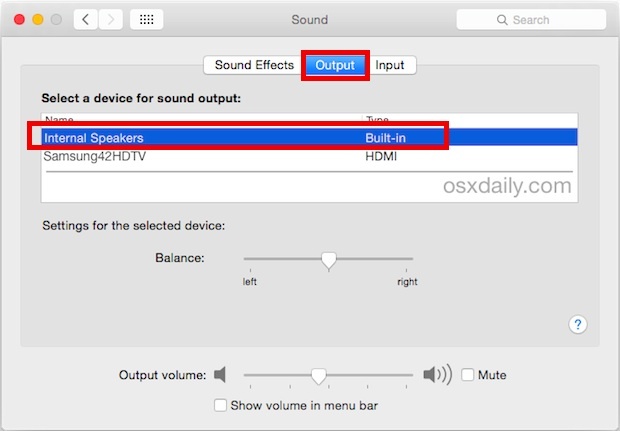 First things first: make sure the Mac audio output is enabled and that the computer is not set to be mute. You can toggle the mute button on a Mac keyboard or use the Sound control panel to boost audio all the way up to make sure the Mac sound volume is not on mute. Sometimes the Mac is simply muted, which obviously when mute is enabled the audio output will not work and sound will not play. If you have already ruled that out, proceed with the next simple troubleshooting steps. * If you have external speakers or headphones hooked up, you’d want to select those instead. Do note that you may need to first choose “Internal Speakers” and then select the external speaker or headphones to get the audio output to work again as intended. Why does this happen? It’s probably a simple bug where a different audio output channel gets selected or chosen during the installation or update process. This seems to happen most often with Macs that have used HDMI output to a display or TV which has speakers. Interestingly enough, the reverse situation also can occur, where a Mac is connected to a TV and there is seemingly no audio output, at least until HDMI has been selected as the proper sound output channel. This was first reported a while back by early adopters using beta releases of various MacOS versions, but it still seems to randomly happen even with installing the latest releases of MacOS from Mac OS X Yosemite onward with a wide variety of Macs. Occasionally, the same situation occurs randomly after installing an update to MacOS as well. Just remember if you experience this, it’s no cause for panic, it’s a simple fix. Thanks to Kerry for the tip suggestion. If you have any other methods or tricks at restoring audio that is not working on a Mac computer, share in the comments below! Not sure if this is directly related, but this happens often when I use Voila, the screen capture app, specifically when capturing computer sound output along with the video. After capturing and shutting down Voila, the Sound Output stays on “VoilaDevice” and I have to change it back manually as described above. I’ve noticed the same thing with other apps and putting in the headphones even, it’s like OS X won’t recognize the device has disconnected sometimes. I don’t think this is limited to OS X Yosemite but you never know given how buggy it is. Oh and you can sometimes, SOMETIMES, fix it by option+clicking the Sound menu item and selecting the Output, then repeating and selecting the output yet again. My ipadair with ios8 goes mute sometimes. It seems to have something to do with listening to audio books. The only “cure” I have found is alternate refreshes and reboots until the audio works again. Another possibility is to hold the option key and click on the speaker icon in the top right corner: it will show a list of all input and output devices, with a checkmark indicating the current default. THANKS!!! Misread your post and held Option key while toggling speaker louder/softer keys on top row and the Sound Preferences window that had only showed digital out went back to showing internal speakers…! Suggest others play with either this or your suggestion to fix the problem. I have the opposite problem. My internal speakers work perfectly, but the input microphone does not work. I have a Dragon microphone input through a UBS slot, and that works with dragon. But neither the internal microphone, nor the dragon microphone, nor an external microphone give an input. Only the dragon microphone shows sound level varying. The problem began after an Applestore replaced my internal hard drive. Check your System Preference to be sure audio input is not on Mute, then check System Profiler to make sure audio input is still possible (hardware wise), it’s remote, but remotely possible that an internal cable was disconnected. Most of the times when I want iTunes to play it’s music via an AirPort, I must configure this in the Sound configuration instead of in iTunes interface. I have also noticed that when I plug in a headphone, then close the lid of my MacBook Pro so it goes into sleep mode, remove the headphone and open the lid again to awake my MacBook Pro, there sound is no sound. I must re-select the internal speakers from the sound configuration to make it work again. I hope Apple will pay more attention to stability and reliability over new gadgets and unwanted new software features. I have an issue re sound output when I connect my MacBook pro to HDMI on my tv. The tv doesn’t appear as a selection in the sound output menu. I get video on the tv screen, but the audio won’t go via the tv. Anybody know anything about this? Yes there are multiple issues with audio not working with HDMI. First and most important, you must have a truly compatible Mini DisplayPort to HDMI output adapter that allows audio output (not all do support sound, amazingly enough), often the super cheap ones on Amazon do not support sound so you want to spend a little more for ones that sound is specifically mentioned, MonoPrice, etc, but there are many on Amazon that do, check the comments. Then you must have a decent HDMI cable which most are acceptable. Then it is a matter of selecting the proper output channel for sound. 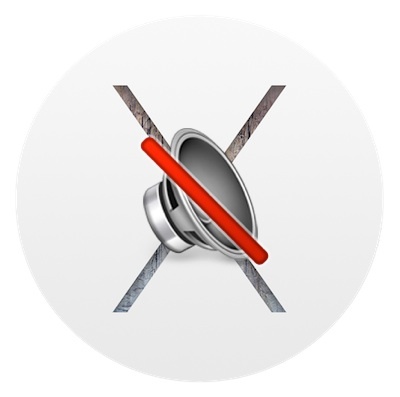 Hi, your solution may help many but does not fix the main Yosemite audio bug. For those of us with audio interfaces, we can set the in AudioMidi or with the delivered software. Certain apps, such as safari, don’t use AudioMidi but have hard coded defaults that do not follow the rules set down by apple. I have iTunes in my interface, opera but not safari. Please investigate this issue more fully. I have noticed that when I press the top row key 4th from the right side on my 2011 Mac Book Pro, I also don’t get any sound. It is so frustrating sometimes. And having to actually press the power button, and wait for the system to boot up when it is powered down. Why can’t it just know when I want to use it and turn itself on? The girl in the Apple store told me it could do that, so I bought it. She probably meant by it being able to turn itself on when you want to use it, is the “on and off” feature. Go to system preferences (it should be on the “dock” by default), then go to energy saver. at the bottom right of the energy saver window should be a button labeled “schedule”. press that, and then there should be a window that allows you to set a time when your computer turns itself on/off (why I nicknamed it the “on and off” feature :P ). What should I do if there are no output OR input devices to select from. There’s nothing listed in those tabs, and I’m just at a loss of what to do. Same for me: I have two Soundflower channels I have yet to delete, which don’t produce any audio/receive any audio (mic). What exactly is the difference between audio and sound (as per the title of the article)? Same-sameness. After the update to Yosemite 10.10.3 my sound output is set to Airplay and there is no alternative. I don’t know how to resolve this: my internal speakers are gone from the setup option under Sound. Problem solved. First I called Apple, they tried to reset the iMac. Didn’t work. So they told me to bring it in. Next I opened Launchpad and saw an icoon with the Yosemite update. So I installed the update again. And guess what? Sound works again. Same problem as your original one ERik… but I don’t have Yosemite in my launchpad. Flippin’ Apple… Jobs dies, so does the innovation. Getting tired of this. Nothing is ever so simple, my friend. WHAT IF “INTERNAL SPEAKERS” DOES NOT APPEAR AS AN OUTPUT OPTION? Backup your Mac, update the system software, then Reboot your Mac. And turn off your CAPS LOCK key. When I go to my sound preferences, I have no “internal speakers” option, only “digital output”. This is after updating to Yosemite 10.10.4 on my MacBookPro. Anyone know how to fix this? I’ve been having problems with my sound preferences defaulting to internal speakers. I keep going into preferences and changing it to line out, and it’s good until the next time I reboot my computer. Then it defaults back to internal speakers again. It’s getting very annoying to have to go back in there and change it every time I reboot. Why won’t it stick?? Nay, this problem is not related to the selection of an internal or external output device. although mine always selected the internal speakers by default, it still mutes the internal speakers. to fix this problem you would have to look into another issue called AirPlay. if you have a wireless network installed in your home theater system, then the AirPlay will automatically connect to the wireless audio network. in my case i have Denon Wi-Fi enabled receiver. Every time i start my macbook pro the AirPlay automatically selects Denon AVR-5200. this is why you see blanked speaker icon and no sound emits. i’d say AirPlay is a lame system that needs a lots of tweaking to fix this problem. if the case was of an external speaker or output device such as pictured in above image as if the HDMI output selected, then after you reselect the internal speaker and restart the computer then the internal speakers should remain selected thereafter. as it happens with my macbook pro, it continues selecting the airplay enabled device. and my Denon receiver does have an AirPlay builtin. so the AirPlay is the real problem. I don’t have a wireless network for my Mac. It’s a work computer, so network is hardwired. I just have ordinary computer speakers hooked up to it by the usual speaker jack. Another thngyou may want to check: If you upgraded to Yosemite, and Garage Band was previously active, but not installed under Yosemite, this can cause problems as well. Reinstall Garage Band and the sound/audio for ITunes and any other virtual synths you may have will return. This is what happened to me, so it’s possible it may happen to others. Hi, I have experienced this same problem when I tried to plug in some external speakers to my MacBook Pro (Retina, 13-inch, Early 2015). It updated to the most recent version of Yosemite, though this to me was not the cause of this problem. As soon as I couldn’t hear any output from the external speakers I instantly removed them only to find that my Mac has now disabled the volume altogether. I attempted to use the key buttons to add/decrease volume but am met with a disabled volume sign. I have read countless internet entries on solving the fault and have tried numerous times to plug/unplug headphones. I had seen the red light a few times during this process and heard a repetitive clicking noise when headphones we’re plugged in. I attempted to reset the PRMC and SMC with no luck. Now, the systems preferences folder reads “No input devices found” and “No output devices found”. It seems to work once I plug a HDMI cable and the sound then plays from the TV but nothing changes on the laptop. How can I fix this problem without having to shove a toothpick in the plug socket? This has happened to me twice now. No sound at all: no itunes music, no video playback sound, no alert sounds – nothing. None of the fixes work as the system preferences appear normal. Connect some headphones into the jack. Play a song in itunes. It will be audible. The song is now audible through the speakers. Crazy but works for me. Had this problem ever since updating to Yosemite. I have a MBPR 15inch, 1st version. YessssssssSSSSSSSS! Plug into headphone jack, then unplug. Sound is back! After trying just about everything I came across a tip to apply high pressure air-duster to the port. That solved the issue! Apperantly dust might cause the sound to be routed to an optical channel, causing the hiccups. Don’t blow your saliva in, that won’t help, use a professional air-duster spray (and dust your Mac internals from time to time too). Cheers! I don’t have the option to select “Internal Speakers” – “Built In” my only option other than Apple TV or bluetooth speakers is “Digital Out” – “Optical digital-out port”. What can I do to fix this issue? I’ve tried pretty much everything out there and it still won’t adapt…please help! You actually need to go to ‘Sound Effects’ in sound preferences and choose your speakers here. I came across this thread upon finding that my internal speakers would not show up as an option after I had used an external speaker for amplification. Tried the solution described by Si Knight in August and it worked after that. My mac book pro used to automatically select the audio output. If I plugged my headphones in, they would mute the speakers and the sound would only come through the headphones. I have an apple display and when it was connected if would automatically know to play audio out of the display. Now, I have to manually select it from system preferences or for the menu bar. Can someone help me figure out if I can get it back to automatic? tnx heaps. Cause is bad contacts inside the heahphone jack, in the Mac. Solution: jab a headphone plug in and out of the jack a few times. That reseats the contacts and “Internal speakes” shows consistently in the list. Maybe the internal contacts are dirty or gummed up a bit. Try a bristled toothpick from the pharmacy. Else the contacts inside the jack are overstressed so no longer contacting (shorting) so Mac assumes something is plugged into it so drops “Internal speakers” from the list. They may have designed this better. This is a hack I know but the alternative is a trip to apple store with some $$. I only updated to Yosemite a week before El Capitan came out thinking the bugs would have been sorted a year after release and I wish I hadn’t. Bugs are everywhere. I don’t remember having a single issue with Mavericks and already have had a handful on Yosemite. No wonder Apple’s focus with El Capitan was on functionality and bug squashing. I get this audio issue every single time I boot my iMac and have to configure settings. It’s no big deal but something I shouldn’t need to do and something I didn’t do once with Mavericks. Apple really should allow “downgrading” of OSX, which in my opinion would be an upgrade going back to Mavericks. Yosemite is a joke and Steve Jobs would not be impressed with Apple releasing such a terrible OS. Thank you – now have sound again! User error, works for everyone but you. Sound and audio work great for me in OS X El Capitan and OS X Sequoia! Jokes on you Cruz! Maybe you should read the instructions to fix the audio working in your Mac. I never had this problem with OS9. Nor with 10.6.8 for eight years and now since getting the 10.10.4 (Yosemite) sometimes when I unplug from the power supply and replug the sound is gone. The only solution is to reboot. Since I am not interested in quick fixes, but prefer a permanent fix, is the only option then switch to Microsoft 10? I could imagine that either the Yosemite “software” is rubbish, full of bugs like Windows, or maybe the world is really (truly) going down the drain and Apple is no longer the trademark we CAN RELY ON, but just another company trying to make as many bucks as possible. Please explain before I have to sell this MacBook waferthin “modern computer” to someone who doesn’t mind working with trash. What if there is no internal speakers option. There is no option other than ‘virtualaudiodriver’ which says it has no output. There isn’t even a chime on start up. Reset pram, turned off bluetooth, rebooted, no red light coming out if any ports. 2011 iMac. As far as I can tell this is not a duplicate response. Oops, I guess it was. My issue still stands though. Didn’t fix anything. Your instructions are obvious, and not a fix at all. This fix totally worked for me! Thank you! I was getting ready to visit an authorized apple dealer to fix the problem. and where is the “Internal Speaker” anyway? I couldn’t find that option in Output. The only option that I have is “Digital out”, with the message “the selected device has no output controls”. do you have any solution for this? In the Sound Effects tab of the Sound control panel (in Sys Prefs, of course), click on “Play feedback when volume is changed.” I have had this audio problem twice on two different machines on which I foolishly installed Yosemite, and this is how I have solved it. It’s funny how you’re like “this will fix it” – it was already on Internal Speakers – there’s clearly a bug in the OS, has been for a LONG time. Your advice will be gratefully received. Even when I do this my sound still does not work whether I have earbuds or nots, can anyone help me? Thanks a lot for taking the time to write this. It helped me. Thank you. Great instructions. Problem solved. I had the same problem – no sound, no internal speakers in system preferences. Called to Apple support: they recommended to turn off Mac and turn it on while pressing option+command+r+p keys. Thank God I found this article before I took it to the service center. Eerily, it happened just after I dropped my mac! Thanks a ton! Thanks this helped fix my problem! Thank you. It works for me. Fixed my not working audio output when by ; at start up (after a complete shut down) and log in, press all at once; option+command+r+p. Hear a bump sound and audio is back!? But if I let Mac shut down on its own, I have to do it again, but if I shut down manually it will be ok. Question; I have high Sierra. It wants to upgrade to Mojave. I’m afraid what will happen then!? Hope this helps.